On a lazy summer day at the beach, we dug clams and cooked them on a camp stove as the sun tracked across a cloudless sky. Sitting in the sand, staring across the bay, we almost missed a seasonal goody within arm’s reach, right behind us: a carpet of edible greens running the length of the beach. I grabbed a handful and added them to the pot. They go by many names the world over. Pickleweed. Glasswort. 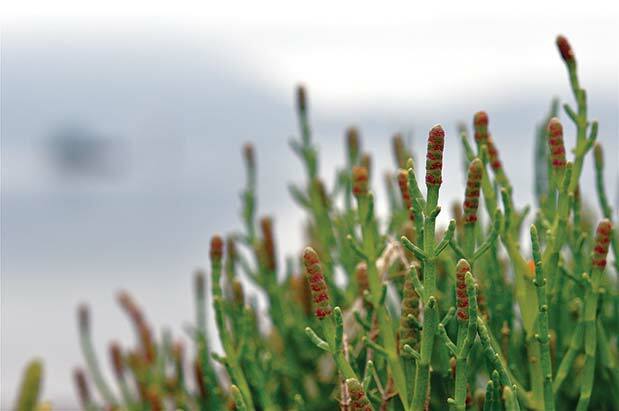 Samphire. In Alaska and elsewhere on the West Coast, they’re sometimes called beach asparagus; in Europe, sea pickle. Scientists call them by their genus, Salicornia. Around Puget Sound, they’re commonly known as sea beans. These salt-tolerant plants grow above the high tide line along beaches and in estuary marshes. The Washington shore is loaded with them, so they’re now on restaurant menus all over Seattle. The plant forms a dense mat, branching into many tendrils, each one segmented and thinner than a pencil. Harvest sea beans by simply snapping off the tips, the tender top few inches. You can eat them raw or cooked. They’re firm, succulent, bright green and mild tasting. Sea beans tend to take on the flavors of whatever they’re cooked with. They make up for their lack of distinct flavor with their texture and dazzling color. Plus, owing to their habitat, they’re naturally salty. I make sure to pick a mess of sea beans whenever I go oystering or crabbing during spring and through early to midsummer. They’re often an afterthought—but they shouldn’t be. Sea beans have a lot to offer, especially as an accompaniment to other fruits of the sea. My friend Becky Selengut, author of Good Fish, made a beautiful oyster succotash one evening after a day of digging clams and collecting oysters—and sea beans—at a South Sound beach. 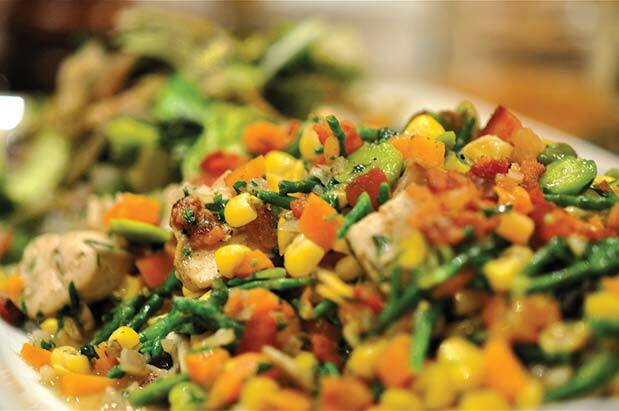 She tossed together a cup of sea beans, corn off the cob, diced carrots, shallots, bacon and pan-fried oysters. The dish was sweet and salty and alive with vibrant hues. Sea beans work well with whatever you happen to forage at the seashore. Add just a few to deliver a counterpoint of crunch and color. I’ve enjoyed sea beans steamed alongside spot prawns, sautéed as a garnish for grilled salmon, stir-fried Sichuan style with sliced geoduck, and lightly blanched in a seaside salad with another beach green called goose tongue. By midsummer, sea beans start to show specks of red near their tips, which in turn develop into tiny yellow flowers. Their harvest season is over by this point. But you can enjoy sea beans year-round by pickling them. They make a crisp and savory treat right out of the jar, and an attractive garnish for other seafood such as fried razor clams or poached halibut. And on those days when the clams or crabs don’t cooperate? Sea beans are a ready and willing consolation prize. Follow Langdon Cook’s further adventures at fat-of-the-land.blogspot.com. The sea beans, bacon and corn combine for a salty sweetness that’s taken over the top with fresh oysters. 1. In a large skillet over medium-high heat, cook the bacon until its fat is rendered and it’s crisp. Remove bacon with slotted spoon. 2. While bacon is cooking, blanch sea beans for a few minutes in boiling water and then shock them with cold water. Set aside. 3. Add butter, shallots and carrot to skillet. Sauté until soft, about 5 minutes. 4. Add thyme, lemon zest, sea beans, edamame and corn to skillet. Sauté until corn caramelizes, about 2–3 minutes. 5. Deglaze with oyster liquid and reduce until dry. Add oysters, lemon juice and white wine vinegar. Season to taste with pepper and Tabasco. Garnish with parsley. Adapted from a dish devised by Jeanette Smith and included in Becky Selengut’s cookbook Good Fish.